OneDrive support added. You can now use OneDrive to synchronize mind maps across devices. Auto Focus can include cross linked topics. Branch borders can be added to central themes. Bug fixed in Nextcloud support: directory names containing a dot caused problems. v1.21.2 beta – released 5 Sept 2018. Nextcloud support in beta. Version 1.21.1 – released 27 Aug 2018. Fixes an Android 8.1 related crash that occurred when synchronizing to Dropbox or Google Drive when switching away to another app. Crosslinks can be used to make a summary or merge paths (A in image below). Manually toggle the crosslink style via “Toggle cross link style” in the relation toolbar . You can use this to style as a “normal” crosslink or to style as a hierarchical relation and merge paths or make a summary. Read more..
Scroll using 2 or 3 fingers. This can be used when an image leaves no empty space to scroll. Allows Dropping on collapsed topic. Add Shortcut to home screen restored for Android 8.0, displays a mind map thumbnail. Dropbox fix: Dropbox does not accept dots in file name, this could cause problems in uploaded and linked documents. Breadcrumb bar in Mind Map Explorers for quick navigation between folders. Import text files (.txt) – Local: import from File; Dropbox, Google Drive: import from Mind Map Explorer. Much improved Android 7 multi-window support. Handle text dropped from other apps. The Top-Down auto layout has 2 new layout directions, Top-RightToLeft and Bottom-RightToLeft. Markdown text markup commands in action mode bar (popup menu). Outliner shows dates and has a filter to show only topics with a date set. 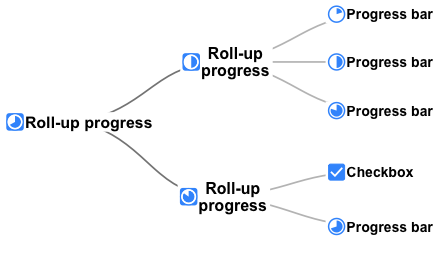 Progress bar checkboxes (0% – 100%) and roll-up progress checkboxes (progress automatically calculated by averaging progress from children). Set a date for a topic. Insert Sibling Topic: similar to add sibling, but orders new sibling before current topic in parent. In auto layout mode the position on the mind map page is set accordingly. You’ll get a warning when delete/cut results in an empty mind map. Fixed: Mind maps containing new Android emojis can be opened on iOS / Mac OS X. Essential Dropbox API version update. Print a Mind Map across multiple pages. Print or export selected branches only. Live Checklist, TODO list and DONE list added in Outline. Labels can have Call-out styles. Standard style sheet Natural + Colors uses Auto Tapered line style. Add Child and Add Sibling buttons in Topic dialog (Android 5+). Make topics and labels underline or strike through (via font style). Auto scroll support for tools, moving elements and lasso selection. Word Wrap tool maintains paragraphs and lists (markdown syntax). Option “Apply Word Wrap” controls default word wrap when adding topics and labels. Automatic transfer of SimpleMind Free Mind Maps on initial run. Displaying “up” parent folder in Dropbox and Google Drive, making navigation easier. Outliner, shown in the image below, replacing the “Reorder topics”. On larger devices the outliner is embedded in the Mind Map editor and synchronizes the selection with the selection in the Mind Map editor. On smaller, phone-like devices the outliner appears as a pop-over panel. 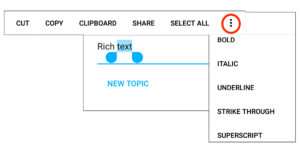 Use drag & drop in the outline to reorder topics. Tinted collapsed and hidden topic markers. Workaround for android 4 bug. The text editing buttons (cut, copy,) were invisible. The style sheet selector now shows preview images. Improved interaction with other apps opening *.smmx files. 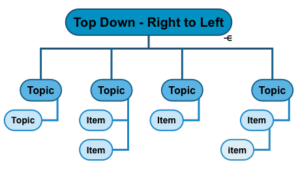 Use drag and drop to rearrange the topic order in auto layout modes. Choose a default Layout Mode for new Mind Maps in the Global Style Options. External keyboard navigation with arrow keys improved. Warning to prevent loosing local changes when disconnecting from Dropbox. Rotate Left / Right added to image picker. Device and platform independent rendering. Double tap on Image opens the full size image. The image link tool is removed.